Forgey-Cabin 1972 Canoe Expedition, Building a wilderness cabin. remote rivers for 2 months? Club, headquartered in New York City. October 21, 1975, and remains an active member. The first publication of his book “Wilderness Medicine” was 1978.
and brook in earnest, deaf to her calls. that most people never even consider. Vilhjalmur Stefansson, a Canadian born explorer of that country’s vast, frigid, expansive arctic, is quoted as saying "adventure is a sign of incompetence." where everything is planned out, and surprises were a sign of poor planning. “My Life with the Eskimo” in 1913.
team members Tim Davis age 17, and Wesley Gray age 15. Every trip begins the same, when your right down to it. First, you gotta get there. And check in with the man. Wesley Gray left, and Tim Davis right. The second voyage of the Muskikeyinew. and major events during this voyage. 4 June 1972 Leave Bloomington Indiana, arrive Gary Indiana. 5 June Leave Gary, arrive Alexandra Minnesota. 6 June Leave Alexandra, arrive Winnipeg Manitoba Canada (Best Western). 7 June Leave Winnipeg, Arrive The Pas. No room in the hotel, so allowed to stay in basement lounge. Train leaves Friday. 8 June Talk to Mounties, give them itinerary. Fix hole in gas tank. Arrange storage of car with railroad detective. 9 June - Friday - Train arrives at Pawistik at 8:30 PM. Smooth unloading and get away, executed with several batches of American Fishermen and Indian guides looking on. Slept on Swamp Island. 10 June - Saturday - Get slightly confused on get away, regain navigation and proceed through channel just beyond Shaving point for campsite. Total miles so far about 12 miles. Weather beautiful but cloudy late in day, sprinkle at supper. Temp ideal. Wes gets first nibble, Wes gets second nibble, Tim gets third nibble, Bill 4th nibble and first fish, small jack (northern pike). I take hike in deep moss covered forest to check navigation. Mosquitoes plentiful. 11 June - Sunday - Left at 1 PM. Weather excellent. Camp near Bird Bay. Complete shooting 1 roll color film, most of B/W roll. Fish, shoot rifles at evening campsite. Catch 1 Walleye, 3 Pike. 12 June - Monday - Wake up at 5 AM. Fill out journal. Day becomes rainy, wind blows from South East. Waves fairly high, lunch in rain storm on leeward side of island (High Rock lake). Cold and miserable, decide to camp there. Can't find a good spot and place is crawling with mosquitoes. Decide to keep going although waves are high. Worried about fatigue in case of accident. See a pair of bald eagles, they circle and land on top of a tall tree. Finally get tired enough to quit, have been trying to take advantage of South wind, riding it North to Northern most island in main part of Highrock Lake. 21 miles today. Weather turns beautiful. Swim, finish drying clothes, poor luck fishing. Have lost three lures and leaders so far. Tim Sharpens knives. We get to sleep while sun is till high - 9:30 PM. 13 June - Tuesday - Get up about 10:15 AM. Weather overcast. Wesley burns hand on 1 1/2 cups boiling water. I fall on rock trying to take pictures of camp. Wind high, waves get very high, make it to Highrock falls. Land on right side and scout area. Driving rain starts, we have lunch. Need to cross to other side. Wait for waves to subside. Largest waves of trip so far, 2 foot. Splashed over front and sides every now and then. We canoe to other side. Make portage on left side. Canoe to 2nd falls and make camp on left side portage. Driving rain is continuous. Rig tarp over front of tent. Eat supper and clean rifle, spinning reels (change line). 14 June Wednesday - Wake up at 9:30 to cold and driving rain. Stay in tent and eat cold breakfast. Get up about 1 PM when clouds break. Sunny day but windy and cold. Bad luck fishing, loose several more lures (swivels on 2 wire leaders break with fish attached ). Days catch of 2 walleye and about 7 pike. Not caught in time for supper. Eat hot lunch and hot supper. Take several pictures of boys fishing. Shoot rifles. In bed by 11:30. Hear strange movement in forest. Stretch of river below rapids looks very treacherous, will line our way down stream a ways, his will be hard. Plan route by candle light. Tim's Northern Pike 4 lbs 2ft.4in. long. 15 June - Thursday - Wake up at 9:30. Hot breakfast, struck camp and start portage 1:30. Beautiful sunny day after a very cool night. Wind light, but picks up from south. We pass over first of Devils rapids with no problem, and camp by second set. Catch one walleye for supper. Get to bed by 10PM, very cool night. Made 16 1/2 miles. Power line over first rapids. 16 June - Friday - 2nd set of Devils rapids portaged. Water below very rough and canoe had very little control about where it went in whirl pools. I broke my paddle in passage. Grandville Falls portage on left side. Long portage full of brush, weeds and bugs. Color film shot of Wes fishing on rock in falls, also of Wes being pulled to safety by Tim. Shot of loaded boat and film proceeds to break in camera. Continue to island in Grandville lake. Distance 6 or 7 miles. 17 June - Saturday - Spend day on island. Wes washes clothes. Sleep during afternoon rain. Tim reloads shells. Wes takes over cooking duties. Storm blows in late at night. 18 June - Sunday - Very stormy, rain, wind, from north. Again spend the night on the same island. 5:30 PM snow starts. Wind high. Eat supper over Gerry stove in tent. Wrote Jordan about food. 19 June - Monday - Snow fell all night and morning. Became flurries late in morning. Wes decides we should spend today on the island. Flurries subside about 3:30, low cumulus clouds, very cool, wind 20 MPH from West. By 9:00PM sky clears, temp cool. Scattered snow clouds in distance. Fix hot supper (Wes does good job), over outside fire. Decide on early start and cold breakfast tomorrow. Wind stops by 10PM. 21 June - Wednesday - Up at 10:00 AM. Have difficult time with large whirlpools in straights north of Grandville lake. Get lost in islands, have difficult time with current going the wrong way. Reach Lake Thompson road highway bridge. Hitchhike about 1 1/2 miles into small mining development town of Leaf rapids. Tim spends $12.00 for our lunches. Buy catsup and salt in store. Store and restaurant built of mobile home type units. Tack under bridge and portage Leaf rapids on right side of right channel. 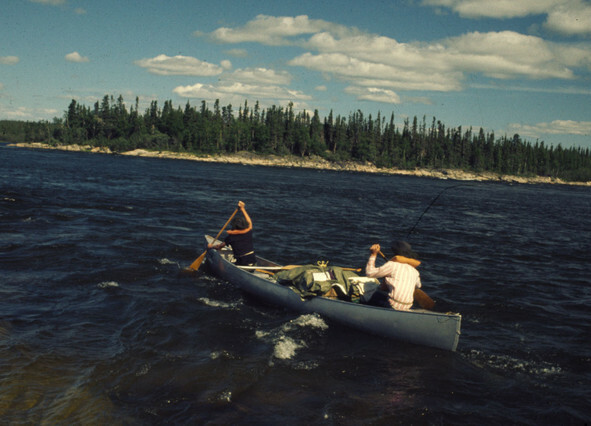 Canoe down river to camp in vicinity of first large island. Fast water on left side of island (water boiling). Take B/W roll #3 and start Kodacrhome roll of sunset and camp scenes on longest day of year. Beautiful evening with thundershowers in the distance. Wes does great job on chili supper. 22 June - Thursday - Wes does great job on French toast. Falls in water washing dishes, then drops coffee pot lid in water trying to load it in canoe. Tim dons goggles and retrieves it, take several color shots. Canoe to point half way up lake Opachuanau for campsite. I drop lid to coffee pot. Tim retrieves it this time by the stretch and reach method. Day very warm, many thunderheads, no showers hit us. 23 June - Friday - Wake up at 10:00 AM. High wind from West (off shore for us), light rain. Have hot breakfast and wait for wind to die. Tim reloads 30 -30 shells, Wes fixed his boot with needle and heavy thread, and I write letters. We take off and make 2nd peninsula on South West coast of Southern Indian Lake (Sandy beach). We get to bed early, after target practice with the carbine. Wes chops three trees. Tim make spruce entrance mat for tent to keep sand out - great smell. 24 June - Saturday - Wake at 10:00 AM. Tim takes over cooking duties. After great breakfast, we wash clothes and mess gear, and take a long swim in the sheltered, sandy beach. Water and sun felt great. Beach flies bugging us, but fail to do their thing (bite). Fair wind from the West. we break camp and hope for good mileage. Make camp at 9:00 PM 21, miles later. Saw 2 Bald Eagles setting on island 4 miles South of mainland point, campsite #16. One flew away immediately, the other stayed around. We turned around in high waves to obtain photograph with no luck. Must be off tourist route, finally. Indian visits us at campsite, first of trip. He started fishing four day ago, has been working hard getting fish storage house ship-shape for inspector. Wes visits Indian camp behind us. It was the man's wife, their children, and 2 of her brothers (14 and 12). Their kids are toddlers. Stuff ourselves at supper, I write some letters and we fall asleep. Awakened by dogs almost immediately (midnight). 2 large beautiful huskies. We move food stash to front of tent. 25 June - Sunday - Wake at 10:00 AM by visitors, woman and kids from the camp repaying Wes's visit. She brings out some neck bands with peace symbols in bead work to sell $3.00 each. I call Tim and Wes back from beach, Wes buys 2 and Tim 1. This appears to be a reverse of the traditional Indian - White relationship, they are selling us the trinkets! By the time we break camp and load the canoe we are wind bound. We will attempt to camp just North of the Hudson's Bay Co. post tonight, and go there tomorrow . We understand from our visitor that they are expecting a new manager today (or soon), and I imagine they will not feel much like entertaining this evening (or soon). 3 PM. Have given up on getting away for awhile due to wind, will wash clothes and fix a hot lunch. Wind does show some sign of abating, however. 6 PM left campsite finally. We canoed clear to the H.B. Post, asked for permission to camp at a trailer belonging to a dentist, French guy about 45 years old, and his 2 assistants (young cute females). We pitch our tent next to their trailer and the generator. We get to bed around 1 AM, ate cold lunch in trailer and yakked. 26 June - Monday - Up buy 8:00 AM. Eat cold breakfast in trailer after dental team leaves for their clinic in the school (by motor boat, about 1 ½ miles away). We mail letters from H.B. Post, and buy provisions. We also get 1 Doz. eggs and 1 LB of bacon and a loaf of bread. We eat everything for lunch, not just a little bit, but everything. It took a carton of coke to get it all down. We take off after a storm. We stop just past the school and say good bye to the dental team. We canoe about seven miles and camp on a burnt over island. Strange echo, almost amplifies quality. We fire 1 30 - 30 round, to test effect, spectacular. We can see smoke from a fire north of us. 27 June - Tuesday - Up by 10:00 AM. We swim on shallow sand beach, fix breakfast and take off. Large horse fly accompaniment proves a nuisance. Sky shows many thunderheads. We discuses the attitude expressed by many of the Indians, that an attempt to reach Fort Churchill is nearly impossible. Make up our minds we are going to make it, however ominous the talk. It’s been done before (in the old days). Thunderstorm hits and we pull over for it to pass. Heavy smoke from a forest fire surrounds us. This points out another menace to the journeys success or even survival. We discuss how we think we can survive in a fire and how many days we think we can lose waiting one out. About 4 PM we have lunch while another thunderstorm hits. We put up large blue (nylon) tarp. The storm blows smoke away. We continue to edge of map. Just North of 57 N latitude line. We are visited by an Indian and his wife from a nearby fish camp. He says the fire is forty miles east. He mentions that some Americans in kayaks may have made the trip several years ago, but he isn’t certain. Several parties have turned back he says. Some before reaching here. He plans to move his fish camp north, near Missi Rapids within a couple days. He says he makes about $100.00 a day on fish - that’s some 12 million lbs. of fish that have been taken from this lake over the last 25 years. We eat supper in a light shower and go to bed. 28 June - Wednesday - Up by 10:30. We canoe a total of 5 ½ hours and make 18 miles. Some severe looking storm lines threaten, but pass harmlessly to the South. A navigation surprise for me, we reach the end of Long Point, while I still felt we had nearly 4 miles to go. I thought the compass had "gone south" when Wes said “maybe we’re at the end of the point”, he's correct. We made a good camp, shot the 30 - 30, and got to sleep by midnight. Dogs on island, so we eat lunch quietly so they don’t hear us. 29 June - Thursday - Another great breakfast by Tim, and we set out. Wind from North East in our face. At lunch we light a fire and make bread on a stick. A repeat of yesterday. We reach the top (North), of a large island way before I thought we were ready to. The 1st and 2nd edition maps we have found to be very tricky - they leave out large islands occasionally, really confusing. As we round the West coast of the island (hiding from the N.E. wind), we run into rough waves. We fight them head on. Water splashes over the bow frequently. 30 June - Friday - High winds, cold drizzle. Tim and Wes make a balsam bough shelter to eat in, near the fire and canoe. Eat a hot breakfast about 10:30 AM, and are forced to spend the day here. Tim Davis makes a stove from an old 50 lb barrel which now stand shoulder high on a front post and rear sissors. We eat a hot lunch and hot supper. Wes reloads 30 - 30 ammo twice. Help make stove holes with one batch, and cut some trees down with second batch. We discuss a side trip to Settee Lake, time permitting, with Wes staying at a cache on Fiddler Lake. Wes is quite excited about it. 1 July - Saturday - Wind still blowing, but sunny and cold. We decide to have a hot breakfast and try to make Missi Rapids. Fight very high winds at two points, upon leaving camp, and at the approach to Missi Rapids. The wind was still NE and cold. We shipped very little water but took considerable spray. Highest praise to my boat and crew, as it was quite a struggle, and a little awesome at times. Rollers of 2 ½ to 3 feet. Approach to Missi Rapids very difficult; first waves, then we have to take a waist high soaking tacking the boat through swift water to the portage (right side), located at the verge of the cascade. Complete approach at 9:00 PM. Portage very short - 50 ft. We camp right next to it, eat supper (kudos to Tim), twilight at 11:30, hoping for warm weather soon. 2 July - Sunday - Clear day, much warmer, wind low. While Tim fixes pancakes, Wes reloads and fishes, I take photographs. Portage Missi Rapids after we break camp. Examine next rapids (2 ½ miles below), old portage on left side, We back way up (Tim pulling us), and shoot the right side. We decide to attempt North side of island shown on map and thus avoid 2 set of rapids. North Channel proves to be a cartographers joke. We eat amidst the black flies and biting gnats in the swamp we manage to find. Canoe around island rapids to North of island, and able to shoot it. Had to stop at main channel and hand guide canoe along left side. Canoed SE portage around island in Partridge Breast Lake, and camped on E side of lake. Many mosquitoes on opposite shore, with many ducks and several geese. We saw what we think was an osprey At Missi Rapids. There was a nest in trees across from us. I saw a large brownish bird land there early in the morning, but he didn’t reappear. Thinking it was a young bald, or golden eagle. 3 July - Monday - Up late as usual 10:00AM. Double rapids present much in the way of problems. We first attempt right side, unsure, we back up and then walk canoe through first set of rapids, and portage second. River very swift through beautiful gorge. Have lunch in rain. Hit very narrow canyon and stop. Portage on right side is very long, 1 mile perhaps. Camp on start of trail. We're all covered in bites and dirty, miserable. 4 July - Tuesday - Up at 10 AM. Cold breakfast. We start the arduous task of portaging. We finish at about 3:30 PM. Many gnats, flies, and mosquitoes keep us company. We canoe until 5:30 PM, make camp and thundershowers finally hit. Eat hot supper. Beautiful rainbow and sunset. We eat part of a cold lunch for late snack in tent. In bed by 9 PM, asleep by midnight. Loon activity for awhile, stops by 11 PM. Saw a bald eagle at island when we first arrived. 5 July - Wednesday - Maurice J. Azure, via The Pas, Ilford Northern Indian Lake, Manitoba. Up at 9:00 AM. Breakfast, swim, wash clothes. We all are very miserable from bites. We start canoeing at 12:30, and make a total of 20 miles to large island in Northern Indian Lake. Stop at Indian fish camp and give a set of letters to them to mail. They say no one is fishing further down. They know little about the up-coming river. The above individual is working with the Indians, and was the most talkative. He wants a picture of Kirkness rapids mailed to him. Many mosquitoes at camp. Large Island is supposed to have many wolves. We see 2 geese and a red fox. I shoot a role of color pictures. Large balsam trees, beautiful sand beach. There were many, many, many rapids. Evening dinner on the rocks. Muskikeyinew 1972 Canoe Trip Journal; Pasitik (Pukatawagan), To Fort Churchill on Hudson’s Bay, Canada. Cont. Entry  and  have been lost it appears..
 8 July - Saturday - Portage around rapids on old portage trail where we camped on right side. Falls also portaged on right side, starting at brink of falls and ending right below. Tack through surges and ride current at end of back eddy. We contemplated that there may be a better portage on the other side, but we made fast work of it anyway on the right. Took pictures of beaver work, self portrait, and boys tacking in back ground. Continue beyond falls to Fools peninsula for lunch, take several pictures from top of large sand/gravel hill at that point. Wes develops slide. We may have seen an eagle in the distance. Stop at first rapids (5:30), on right side (after scaring many ducklings), and camp. Our attempts at fishing for our supper fail. 9 July - Sunday - Up at 10:30. Put in water other side of turbulence. Canoe through fast water to second point (rapids marked on map), also right side. Make small slide portage over rocks at waters edge. Shoot remaining white water. Land at next marked rapids. This looks short on map, but stretches beyond island on bulge beyond, used long old portage found on right side. Made and ate lunch, which takes until 6:30. Canoe to falls, land at left side. Find portion of an old portage. I cook supper, Tim starts improving trail. He see’s 2 bald eagles. 10 July - Monday - I finish journal entry from yesterday, pack up bedding, and change camera lens to telephoto (hope for eagle shots). We hope to make Billard Lake, but we have this falls, and 3 marked rapids to negotiate. Hope to connect with Canadians to get letters out. Wes starts fire, chops wood, and cooks breakfast (pancakes, syrup, apple sauce, hot chocolate). Tim and Wes wash dishes, I take down tent and we load canoe. I look at water route to the start of Tim’s portage. We walk canoe to point, and I end up swimming at one part of this episode. Tim belays us through. I find a large chunk of ice in granite rock. We reach Tim’s portage which he cut yesterday. As part of his Eagle Scout project, he wants to improve portage trails. This one really needed it. Much down wood and new growth. He and Wes work on it more, I take pictures of them working and of eagles using B&W, then with color film. We make portage from 1 PM to 3:30. Canoe to next rapids, figure they are 2nd set marked on map. Wes fixes lunch while Tim and I recon rapids. We decide we can shoot them. Eat lunch by 4:30 and shoot rapids. We loose it, and to our dismay, sink the canoe. It was a long rapid and we kept getting washed with waves. I told Wes to bail, he used his L.L. Bean hat. We sank at the end finally, and swam and paddled to shore. I took a couple pictures of the boys bailing. We then canoe to within 6 miles of Billard Lake and camp in drizzle. Rain or drizzle most of the day. I cook supper, Wes helps and Tim set up and tries to dry out tent. We took a beating today, but probably wont know how much food damage we have sustained until we have a sunny day. Bedding dry, spirits high (but, perhaps, worried), and we go to bed. First aid to cut, I write in journal - candle out 11:30. We didn’t get to notice 50% solar eclipse in the region today. 11 July - Tuesday - Wake up at 6:30, then 8:30 and 10:30. Driving rain and is cool outside. Everything we own is wet and ripped it seems. It appears that the canoe has a leak and I would guess about 50% of the chow is wet. At least the bedding is dry. We spend the entire day in the tent, mostly sleeping, but also talking about our dunking yesterday, and the route to come. We have a cold breakfast and lunch, and cook a hot lunch on the Gerry stove for supper. Major impressions of the sinking yesterday. Tim - Glad we missed last big rock before we sank. Bill - Wes bailing with sponge waist deep in water. Wes disappearing after we sank. Stuff floating with us -(paddles, the coffee pot, tarp, and box), none of it lost. Tim - Wave in face, afraid of getting pinned under seat, waves really hitting chest hard. Wes - Glad we didn’t have to portage (typical). First time I got to bail water in real danger. Couldn’t see rocks, just large waves, knew we would sink. Bill - Rear of canoe pointing forward after we sank (don’t remember turning around). Tim making an excellent move to miss a big rock half way down rapids. We attend to our various nicks and scratches (from rocks and sharp balsam branches), with Neosporin ointment. Also work on our dry skin problem. I sew up the crotch in Wesley’s pants (acquired during the portage 2 days before). His rain-suit jacket is terribly ripped, really destroyed during the sinking yesterday. Haven’t tried to repair it yet. 12 July - Wednesday - Wake up at 8:30 and sun is shinning. Still rather cool out. Tim cleans up pile of wet gear under tarp in front of tent, hangs up wet clothes. Wes starts fire for breakfast and drying purposes. We start the job of unpacking all of the food, equipment, and clothes to assess water damage and to dry the salvage out. Our food loss is no where near as great as I feared, confined mostly to the pilot biscuits in the lunches. We identify 2 breakfasts and 4 suppers that are pretty well clobbered, and reassembled meals into dried bags. Tim sun and skillet dries pilot biscuits and beef jerky. We eat hot meals today, using water damaged items. Bag 4 had soap in it also, but no harm done. We repack meals into 3 duffle bags with soap, toilet paper, LP gas, etc., and empty duffle bags, into a quarter master duffle bag. We finish the day by washing clothes and ourselves. The entire day being spent in the above proceedings. How dry I am. 13 July - Thursday - Tim gets up at 8:30, lays out washed clothes to dry more and is able to make a very good breakfast from a wet pile of crispy toast (for French toast). It was quite a job as everything was soaked, the powdered drink, syrup, all a gloomy mess. We start to canoe by 1:15. At rapids before Billard Lake, we take right channel around island, tack and shoot rapids. These rapids could have been shot all the way, but using the main channel would have been best, as the island route gives one a blind spot. We have lunch in Billard Lake after examining an unoccupied cabin on the North shore. The Canadians are gone. We get to carry our letters to Ft Churchill. We continue through Billard Lake and swampy area on the other side, camping just above second island, shown on Hechmer Quad map, on left bank. We eat one of the soggy suppers (it turned out quit well), before a threatening shower could clobber us. We were in bed by 9:30 PM, just 2 hours after stopping (if only we could break camp that fast), having canoed 20 miles (fast current). Problem of the day; Tim lost his hat and mosquito netting. Good news of the day; the canoe is water tight, no leaks. Intermittent showers. 24 July - Friday - It rained all morning so we slept late. I repair Wes’s rain jacket, uses a whole roll of AYSTIK tape. By noon it cleared and we got up. We start canoeing against N wind by 2:30. The first rapids we came to posed know problems whatsoever, we shot for left side. Crossed to right side of stream to look for old log cabin site. Boys found new cabin (unused for several years), a little further South, and back from river in swampy area. We eat a soggy pilot biscuit lunch, we are full anyway. We stop on the right side of next rapids and make camp, hoping for portages around marked falls. This is the wrong side to take, as current switches back to this side and makes a mess of things on right side further down. After supper I hike the distance to falls and a little beyond. No portage, no doubt we must switch to other side, that effort will be worth it. I get back to camp at 11:30 PM. Wes kept fire going which I could see at 2 points on my route. Total length about 1 ½ miles. It looked so good I even returned to one point just to look at it again. I tried twice to get through on swamp area on my way back, and came out on the same side I started. I turned a circle within 20 feet! Finally used the compass. Carried the hand axe and 30 -30 carbine (happiness is a loaded carbine late at night in the bush). Wes and I have coffee, see our first Northern Lights. 25 July - Saturday - Rainy and cool. Eat breakfast and clear camp by 12:30. We canoe back upstream and cross to left side. We tack to point 100 ft up from rapids and cut portage in driving rain. Don’t bother with underbrush, just small trees. Clear our hasty portage by 4:45. We eat lunch across from where we had breakfast. We then either tack or hand hold the canoe through rapids (long stretch), along left bank, only occasionally canoeing. At falls, a clearly marked short portage through virgin un- burnt balsam stand, starts just before falls. Complete portage and camp for night (7:30). Beautiful camp site. Weather finally cleared, but we have been wet the whole day. Wes troubled with diarrhea again, 4th time on trip, but Donna gel works. 16 July - Sunday - Leave camp at 12:30. Drizzle turns to pouring rain, as we tack and hand canoe through one rapids and stretch of fast water after another, all along the left bank (which was a fortunate position from the way the right bank looked). We make Mountain rapids by 4:30, and are cold, wet, and miserable. Scenery is beautiful, but what a price to pay to look at it. We put up the tent and got out of wet clothes. We ate a cold lunch, and almost 1 lb of brown sugar one spoonful at a time. Tim started cooking supper on Gerry stove, all in very rapid sequence. I won’t enjoy myself until it get HOT out! 17 July - Monday - Drizzle turning to rain in morning. Wes starts a fire while Tim and I clean last night’s supper dishes. Tim cooks French toast for breakfast. He and Wes wash dishes while I collect firewood. To combat the rain we have a large fire, and it takes a lot of wood cutting to keep it going. Wes and I retire to the tent and Tim explores ahead on foot. By the time he returns it has really turned cold. He fixes lunch and crawls in the tent. We huddle in sleeping gear all afternoon. Wes and I invent freeze dried meals for a scout troop. About 9:30 PM Tim cooks supper inside tent using Gerry stove. Fire is out and rain has turned to snow which is now sticking. After supper I strip and run naked down to check on canoe - I stand in water (thigh deep), and bail her out. Thick snow, steam from the river, noise from the rapids, and snow covered high hills on the other side of the river produce a rather awesome effect. We leave our dishes for tomorrow (everything is dirty from cooking and eating 2 meals), and go to sleep about 11:00 PM. 18 July - Tuesday - Wake up at 9:30 to cold drizzle, snow is gone. It rained or snowed all last night. Wes up at 11:30 to start a fire. I wash dishes from last night. Its very cold out, we will spend the day here again. We decide to cut back to two meals a day during layover days (if behind schedule, which we will be from here on out). I fix lunch at 2 PM. Back into the tent until 5:30, when Wes again starts the fire and Tim washes the lunch dishes. All of our cuts and sores have healed to the point no medication is needed. Wes still is bothered by bites he has scratched. Tim also to a lesser degree. We have taken vitamins daily (Lilly - multicebrim), and the last few days here have been taking a decongestant (welcome Sudafed), During our supper today Wes shot the 30 -30 (I guess he’s ready to move on, I prefer hiding in my sleeping gear). We have managed to dry clothes out somewhat, still an intermittent drizzle. We have talked over the immediate route ahead that Tim reckoned, it looks bleak. He connected several portage trails together across a bay from us on this (left) side. We now plan to tie front and rear canoe painters together, and with our 50 foot securing rope, we would allow the canoe to shoot the deep, fast water at our side (that would equal 150 ft of ¼ inch gold line nylon rope). We would carry all duffle bags to the bay, canoe across it, and then make Tim’s portage. We have lots of hard work ahead, I sincerely hope this miserable rain and cold subsides! Wes reloads 30 -30 rounds, I clean the carbine, Tim sharpens his knife. This water is churn'n with an obvious elevation drop. is crucial to attaining your destination. knee deep in fast icy waters, along side powerful rapids. Pilot biscuits drying in the sun, after a soaking in the river. An expedition long in duration is bound to have cold, dark, wet, windy, tough, long, grueling days. Then you sink the canoe at the end of a set of rapids. Tim sits in the warm sunshine, shirtless, which means bugless, on riverside rocks. Muskikeyinew 1972 Canoe Trip Journal; Pasitik (Pukatawagan), To Fort Churchill on Hudson's Bay, Canada. Cont. 19 July - Wednesday - Cold and rain this morning again. At 11:30 a patch of blue sky shows through, but thick, black clouds still surround us. We hope it will continue to clear. Wes starts a fire. Tim washes dishes, takes down tarp, and fixes breakfast. I sharpen my knife and the axe. There is an eagle nest on the island next to us, with 1 forlorn, lonely, immature eaglet roosting in it. I thought I saw a mature bald eagle the first night here, but I wasn't certain. As morning passes the sky clears, but it remains cold with some passing clouds dropping rain and SNOW. We complete portage of equipment, and let canoe ride down channel empty, Tim belaying. The rope gets stuck in the rocks underwater, and Tim goes swimming (twice, before this misadventure is over), to release it. We load the canoe in a bay, and canoe a few hundred feet to the start of the portage Tim cleared out a few days ago. We carry all items to the end, except the canoe, and set up camp. Tim fixes supper, we ate only two meals today, thus gaining one to extend the trip if necessary. Total work time today was short, but we were cold and wet (especially Tim). Campsite is swarming with mosquitoes, which disappear about supper time. The sun sank behind the trees and it got colder. We have noticed that a temprature approaching freezing seams to be a magic point at which the mosquitoes quit flying, and disappear from the netting of the tent. It seems for the last 2 weeks I can't remember this drone in the forest at night. I wish it would warm up sufficiently so I could enjoy their return. 20 July - Thursday - Light rain intermittent all night and this morning. Tim is up at 11:00 to fix breakfast, pancakes with bacon bar crumbled into them. We are going to crumble the bacon bar into the syrup next time, we think we'll be able to taste it better. We wash dishes in a sleet/snow mixture, but the sky has many blue patches and promises clearer weather. We pull the canoe across the portage. At the next rapids we walk the canoe along the edge, pulled it loaded over trees we cut and, finally had to unload canoe and portage. We ate lunch at one tree slide and kept going at it until we had cleared the entire Mountain rapids complex (Along the left side all the way). Tim and I go swimming several times trying to keep the boat off of rocks, or through losing our footing. The last set of rapids gave us the longest portage of the day, over a low island with loose rock and difficult bushes, made footing difficult. It is 6:30 before we get into the river below. We canoe 2 miles down stream and camp. Large chunks of ice are exposed on shore, Apparently the perma - frost foundation of trees were caught in mud slide. Area has steep slides, wide river, and many signs of recent and old mud slides. Just after we had packed the canoe at the campsite and as we were leaving, an otter paid us a visit. A loud splash announced his presences, or at least gained our attention. It was like somebody tossed a 20 lb rock in the water. We all looked up and he then poked his head up about 10 feet from us. He stayed up about 20 seconds, and then ducked under water to reappear a little further out. He dove again and came closer. This examination of us continued 5 or 6 times. Wes said he felt like catching him a fish. His visit ended and we took off. Besides the Bonaparte gulls, ducks, and geese, we almost walked on a field mouse today. Even though prodded, he only moved a few inches and froze again. At our final campsite we encounter 5 or 6 adult geese, and 8 or 9 goslings. Two adults were swimming with their charges, the other adults were walking along the shore. We noticed adults frequently coming down from the woods or walking on shore. When they detected us, they made a commotion that was almost embarrassing, much as the gulls had (and always do), when we passed their island a few minutes earlier. It has taken us about a week to make 7 miles, due to terrain, weather, and natural instinct on our part to not over do it. Knowing that each day one might probably take a swim and get the outfit your wearing soaking wet. It is a big factor in slowing down progress, especially when it gets cold enough to snow. We could hear a roaring last night, which could be the last section of rapids we passed 2 miles ago, or an unmarked set just ahead. In either case the sound would bounce along these high wooded hills for some distance. Yesterday Tim said he felt the trip was too long. It's not so much the 42 days in the bush, but the nasty weather and struggle since we sank, and the distance and obvious difficulty of the terrain ahead. By evening he has reconciled to his fate. Tim ends his period of working, well done and under frequently miserable conditions . 21 July - Friday - Wes up by 8:30 and started breakfast. Tim up by 9:30 and starts fishing and catches several pike. We will be needing them later in the trip. It's good to know they are still around. Excitement before lunch! We shoot several small ripples (not without concern), and finally bite off one too large for us, almost. We take some water in and only avoid sinking by missing some huge waves on both sides of us. We paddled hard for the left shore and made it. It was obvious that we would have to portage the rest of this unmarked rapid, Tim scouted a portage blazing trees. Wes, Tim, and I started the work of clearing it out, and moving the storage box/seat. We worked to the end of the trail, noticing old blaze marks occasionally. Someone else had ended up as us. It would be best to tuck closely to the right bank and work along that side. We ate lunch and then moved the canoe. How sweet it is to sweat again and have mosquitoes and black flies with us. After completing the portage, we continued to the marked rapids before "The Fours". An old portage trail is marked on this side (left). We camp at the start of the rapids, eat, wash clothes and dishes, and get to bed at 10:00 PM. We have adjusted our schedule to give ourselves until 23 July to reach Little Churchill river -plus 2 extra days if we need them. No rain today at all. Fantastic! This ends intermittent showers or solid rain 15 days in a row. 22 July - Saturday - The portage was completed after breakfast, and we were ready to leave at 12:00 noon. It was basically an easy start over 1/5 mile of moss, but the sliding friction coefficient of moss on the bottom of the canoe being greater than I thought. It proved to be more work than I hoped for. Tim had re-blazed the portage and chopped out the new growth. We canoe to the first of "The Fours", and find we can get through it with a minimum of effort. All told, both rapids are cleared on the left side with 2 short portages, some tacking, and a little canoeing, including an exciting exit from the last rapids, dogging rocks and waves, tight against the left bank. We hit the double rapids (also left side) and by tacking and making a slide portage through weeds, we get near the end for lunch by 3:30. After lunch we tack some more, get in the canoe, and finish off about a mile of choppy, rocky water. Then miracle of miracles, we don't get our feet wet the rest of the day. The next two marked rapids before the Little Churchill River were shot, tight against the left bank, without pause or unwanted incident. The river current aided us in fighting an East wind. This allowed us to canoe about 2 miles above the Little Churchill River, where we finally plunged into the weeds. We climbed a small hill and made camp with the gnats and mosquitoes. We were in bed by 10 PM. We discovered we lost the ammo pouch with the empty 30 -30 shells sometime today. We now have 4 loaded rounds and 1 empty, plus 2 duds (primers didn't fire) Rats! About dusk we heard strange animal noises like a deep growl, and a cat-like wail later. First time for something like that to happen. Journal text continues after photos. portaging its contents, and the canoe itself, then reloading it again. Yes, that's snow along the shoreline in the midst of summer. waiting to charge out into the swift currents to grab a meal. Little did they know, Wes was lurking for a meal as well. Snow and ice is packed along the shoreline under the moss and brush. you've got to portage around the white water. it's like heaven to set up camp where you'll sleep beside calm waters. 23 July - Sunday - Wes up to make breakfast at 9:15. Windy and overcast, a little cool, many mosquitoes. Leave camp at 12:05. Wind NNE. Find we can shoot Swallow rapids on the left side without any problem. High waves and frontal wind slow progress up river. Cannot spot cabin marked on map. I had rather been hoping to meet someone, and also get letters out. Have no problem shooting rapids left side. Stop for lunch. Continue, shooting all rapids encountered on left side, then finally stop near mouth of Little Beaver River, camping on left bank. We have been lucky enough to shoot the last 7 rapids without problem. We made 20 miles today. Too bad the wind was so strong, the current helped, but the wind was a bad deal. Waves were high. Sky cleared about supper. Many mosquitoes at campsite, and we can hear the next rapids. 24 July - Monday - Wes up at 9:20 to fix breakfast, his favorite (Richmore Potatoes O'Brian, eggs and ham, hot choc, applesauce). We have a fabulous day canoeing and shoot all the rapids marked on the map before Portage Chute, that's 10 in a row. It took real effort on everyone's part, and luck. I was sweating by the time it was over. We entered Portage Chute on the left side, and tacked around the portion by the island (after lunch on a mud bank and a quick canoe stop before a big drop), then our situation soured. We could look ahead and see miles of rough water with sheer limestone cliffs on our side. Wes and I took off exploring with map and 30 -30, leaving Tim to fish for dinner at about 4:00 PM. By 6:00 PM we had struggled about 2 miles. The walls along shoreline were still shear. Wes and I returned to camp in a light rain, we were soaked from brushing alder bushes. I had my rain jacket, Wes had his rain pants. We were really tired by the time we got back (7:30). Tim had no luck fishing, but had shot and cleaned 2 squirrels, with a shot through the head using the .22. After having a fine dinner we get into the tent. Beautiful red sunset. We discuss tomorrow and decide to get to the other side by paddling from the island back upstream, quite a ways. We clean the rifles etc. Candle out after I finish these lines, boys all ready asleep, 11:10 PM. We canoed 10 mile today. 25 July - Tuesday - We get up relatively late (about noon), Tim isn't feeling too well. Wes fixes breakfast, we decide to splurge and have both Richmore breakfasts with brown and serve sausage, corn cakes, peaches, and hot chocolate. Tim gets worse, and Donna gel doesn't keep him from throwing up. He doesn't eat breakfast, but goes back to bed after shooting another squirrel. Wes and I stuff ourselves at breakfast, saving some for Tim. I spend the day fishing and land a 2 lb rainbow trout. Also other bites, but only landing the one. Tim gets up at 5 PM and eats his breakfast. Wesley shoots his first squirrel. I'll never forget him coming out of the woods, AR-7 in one hand, squirrel in the other, you could see him beaming through his mosquito netting. Tim shot another squirrel and Wes and I fixed supper (about 8:30). We have quite a feast, Tim gets sick again. Wes and I wash dishes and get to bed. I figure Tim is suffering from eye strain. July 26 - Wednesday - Up by 9:30. We had breakfast, packed our gear down the hill, and washed some clothes out since it was warm and sunny. By noon some thunder showers were evident, as usual. We decided the current was too swift to canoe to the island, and we elect to tack back upriver along the swift, muddy wall, which we had canoed 2 days ago. This takes two portages and a lot of muddy work, especially for Tim who generally walked ahead with 100 ft of rope (front and rear canoe painters tied together). Once past the island, we tack most of the way to the upstream bend. Tim and I both planned on taking it quite a bit further, but it was 4:30 and we decide to get in and canoe to see how well we could combat the current. We started canoeing using a large set of rapids downstream from us on the other side as a marker. A small stream and a bolder sticking out of the water on our side as another marker. We seemed to be doing well and I constantly let the canoe edge out from the bank. We were paddling hard and actually gaining on our markers, slowly but constantly. I continued to commit us to the crossing, all of us mindful of the tremendous falls that marked the start of Portage Chute. By the time we were about half way across we were a little desperate, we were beginning to tire. We were 4/10 of a mile from either side, the rapids behind us were making quite a racket, and I wished I was back in Medical school studying . We back slipped through one small set of white caps, and I knew we were slowly being pulled into the main set. With a few desperate commands and paddle strokes we turned down stream. It was just in time to face some huge waves on the edge of the main rapid. We plunged into them, me thinking that I probably had a couple very lucky partners, if we could make it through this without nose-diving and filling with water, thus assuring us of a water level view of Portage Shoot. There wasn't a chance of avoiding the falls then, in a sunken canoe. We made it through and then turned the boat sideways to the current, the bow pointed right at the shore and paddled like hell trying to make it. We slipped sideways through some small ripples that splashed in only a little water. On several occasions I turned into the waves, and then headed for shore. Thank God we made it. We stood in mud on the right side, too tired to move or do anything but celebrate our deliverance. We then sat on a nearby snag and had a cold lunch. We canoed slowly along the bank, then tacked and finally portaged the falls (not marked as such on the map), at the start of the chute. We camped at the end of the portage on a large rock point sticking out into the chute. A beautiful campsite. Our feeling now is that most of the difficult challenges of the trip are now behind us. I certainly feel more relaxed and able to enjoy this beauty around us, more than I have been able to in quite a long time. I catch a Northern Pike (small), which we keep, hoping for more luck tomorrow morning. The growling thundershowers disappeared and a beautiful night closed on a memorable day. July 27 - Thursday - Today we get up about 8:30. I catch a 5 lb Northern, Tim catches three smaller ones, which I proceed to clean. Supper is assured. While trying to subdue my 5 pounder, I get some minor cuts from the hooks (rainbow runner lure), and Wes manages to splatter his field jacket with blood while bashing the fishes head with the back of the hand axe. We have breakfast and then tacked the chute. This takes three hours - most of this hand operating the canoe along the shore. We eat lunch huddled under our large blue nylon tarp during a rain shower, with substantial storms passing us on both sides. Finally, we are through Portage Chute. We continued down the river after lunch and ran into one sticky situation. The cliffs on the left side have been continuous and getting higher. And suddenly, along this sides cliffs we encountered rapids. Tim and I recon it, and feel a portage would be a full day affair. He scouted along a shelf 10 feet above water level, and felt we should shoot it. We did, successfully! Canoeing along side the massive ice chunks on this side was quite impressive, cold air streaming off them, with sounds of rapids bouncing off loudly. Caves were cut through ice blocks by streams of dripping water. Camp was made by 7:30, Wes fixing supper, me frying the fish. This is the most beautiful spot I have seen on the trip, and my camera advance is broken! A cliff forms again on this side at a point ahead of us, with rapids indicated on the map (I imagine that I see it), and a couple others not on the map between it and us. How long is that cliff, how bad the rapids? Again we seem to have only minimal control. July 28 - Friday - Breakfast in bed, light rain! Tim takes over cooking for a week from Wes, and does so with much style and service. We are slow breaking camp, due to light rain and probably the rather treacherous looking river just ahead. I advanced the film in my camera under the blankets for a shot of this area. 2 PM we leave camp. Unfortunately the cliffs have switched to the right side. There seem to be a lot of drop in the river causing almost continuous white water. We Tack one set before the cliff starts, and make a small portage at one point. From there until just before Bad Cache rapids, we stay tight against the rock wall where the waves aren't two bad. They are pretty large further out a short ways. Just before Bad Cache rapids we came upon some geese. I take the 30 - 30 out and try to hit one, wasting 2 shots. One bullet left. We land and look for a large goose and at least one gosling that hid on shore (the other 4 adults and several goslings took to the water). Tim spots the gosling and I put a bullet through its neck from 15 feet away, thus ending his short life. With storms approaching we stop for lunch. Here I sit under our blue tarp, a hasty shelter after lunch, with a very peculiar reddish color sky, and substantial rain showers and thunder surrounding us, covered as it were with mud and Tuna salad mix. 7PM. After waiting out a rain storm we shoot Bad Cache Rapids, tight against the right side. Wes thinks this would make a good name for a "rock group" (teenage singers that is). In its own way, it is a rock group. We canoe about 3 miles down river and make camp. All in all a very impressive day. Limestone walls, ice masses, all reflecting the sound of rapids, pouring out a stream of cold air. The current is very swift, allowing only momentary glances up at the ice caves, chasms, and water falls that we are passing. We are now operating under our original time schedule. I never thought we would be able to catch up to it again. For supper this evening; fried goose with a triple helping of coconut cream pudding (we are eliminating some of the extra food we saved up to make the extended schedule). We now feel the great challenges of the trip are behind us. We are relaxing in this great, unspoiled, seldom visited, and virtually private wilderness, planning to enjoy the 8 -9 days of travel left. 29 July - Saturday - Tim gets up about 8:00 AM and fixes breakfast, We have hash browns to conserve the grease left over from the goose we fried yesterday. Wes reloads our shells (down to only 4 30 -30 rounds), and I clean the carbine. We leave about noon. At 1:30 we come upon a flock of geese and shoot a gosling. We stop and clean it. About 3:00, we stop for lunch. It's a beautiful warm day, with thunderheads. At 4:00 PM a large storm is approaching and we stop and set up camp. We have only travelled about 8 miles today, we must be getting lazy. The current helped a lot, head winds not to bad. The storm hits at last. We fix dessert (choc cream pie), and continue cooking in the tent after Wes goes out and gets water, the supper bag, and the mess equipment box. We cook a double batch of macaroni and cheese over the Gerry stove. We are really stuffed when we finally stop eating - so much so that it hurts (getting rid of some of the desserts to lighten the load is the excuse). It seems that we should be able to make Fort Churchill ahead of schedule. 30 July - Sunday - Rain and drizzle all night, turning cold. Wes and Tim up by 9:15 to wash yesterdays mess and start breakfast. Cold misty wind right on our face! It's going to be a rough day. Although ahead of schedule, we hoped to put on some miles today. Catch a rainbow trout, keeping it. We approached rapids by 3:30 after crossing to left side. This was probably a mistake. A limestone bluff at this point caused the water to be very turbulent along the shore, forcing the canoe into rough water. We shoot them after a half hour recon. The entire day of canoeing has been in heavy drizzle or driving rain. It's also very cold. Just beyond these rapids we stop next to a stream. The currents is so swift we are committed to this side for awhile. We are cold and wet. We put up the tent, and I clean the trout. We crawl in bed, eating a cold lunch for supper, and fixing an extra dessert for a treat. We also use our last can of butter and made a batch of no bake fudge brownies with walnuts (Richmore), as a special treat, planning to eat them as a late snack. Instead, we fall asleep, although each of us keeps waking because it is so cold, and to check on the brownies, all night. It sleets all night. Must,... keep,... moving,... must,... keep,... pushing,... on. Sandy shoreline campsites beat out rocky ones every time. Shooting another set of rapids. 31 July - Monday - Rain stops in morning, very cold out. We eat the fudge brownies. Tim and Wes get out at 10:15 to start breakfast. Wes is getting good with the metal match now, he has to be, our matches aren’t working well at all. The Gerry stove is plugged and all efforts to fix it have failed for now. Breakfast is pancakes and blueberry syrup, fried trout, hot choc, stewed fruit and coffee. Red Head rapids are just ahead and appear easily negotiable tight on the left side. Mosquitoes reappear. Only 3 marked rapids between us and Ft. Churchill. Red Head, then Running Landing Place (after which we will switch to the right side) and finally Limestone Rapids. A stream enters the Churchill on the right near Limestone Rapids. I think the bank may not be as steep on other side. Just below that point we drop to the 100 foot contour line. 7:30 PM We recon Red Head Rapids - there were several tricky spots along the 20 foot crumbling limestone wall (about a 40 foot sloping mud wall above that). We shot the whole stretch, taking on about 2 gallons of water, but fairly well flying along the water and through the air. We have enhanced our technique and increased our courage considerably. I was thinking during our recon of how many times we have walked along the edge of a raging rapid discussing the entire route of where we would maneuver tight to the bank, outside of a line of white water, back to the inside and so forth. Part of the discussion is always “in case we goof it up”, what do we do? Which side to swim to, how far to the next falls if we get swept that far, and what to do then. We designate a rendezvous point in case we get separated. We also plan our escape in case of total destruction or loss of equipment. From this point we would have to cross the river, and then hike 15 miles to the Canadian National Railway line. At most points the best we could do would be to bivouac along the river awaiting search planes. Soon the recons will be a thing of the past for us. Once Red Head Rapids was cleared, we quickly covered the 2 mile stretch to Running Landing Place Rapids. It was nothing, not even a ripple at this water level! We celebrate by eating lunch and started out for Limestone Rapids. The water was too turbulent, current too swift, and rapids ahead too severe to cross to the right bank as originally planned. We arrive at an unmarked rapid at about the same time as an approaching rain shower line. Tim and I recon the rapids after a rather quick stop which involved Wesley making a flying leap from the boat, and literally getting drug along the rocks on the shore. (Flying Leap Rapids). We decide to make camp on top a hill at this point, entirely avoiding having to canoe into a long stretch of mud banks, a rain storm, and an uncertain future with these rapids. It is still chilly enough for field jackets and wool shirts, but the mosquitoes are out in full force, perhaps the worst ever. A virtual swarm. Before I could drink a cup of kool-aid, three of the little fellows got excited and drowned in it. And I didn’t set that cup down before drinking either. Washing dishes was really a chore. So many mosquitoes flying they could make you dizzy, as you stare down at your infested legs. It will not be long and we will no longer have to worry about them. But we will also miss this beauty. The face of the land has changed again. We have canoed beyond the Northern tree limit! Along the river there are grand, large spruce, balsam, and tarmac, smaller aspen and alder bushes. But back behind us, a plateau of Muskeg swamp, barren except for dwarf balsam and a wealth of mosses, liverworts, wild flowers and mosquitoes. The sun sinks low in this stark beauty on our side of the river. A rainbow, short yet thick and brilliant, forms from a small shower on the other side. With all of our exposure to the wilderness, we are still awed by it all. We are excited by our proximity to Ft. Churchill and civilization, with its glazed donuts, fresh eggs and people. But most of the talk centers around “the next time”, meaning the next trip. We already have plans, and these help cut the sadness that within 45 miles our adventure is at an end. 1 August - Tuesday - Light intermittent rain showers, heavy continuous mosquito’s visitation, and it’s warmer than yesterday. Tim and Wes out at 9:30 to start breakfast. We get away by 12:30 and canoe hard. We start with the excitement of completing the rapids we camped next too. Only picked up a gallon this time. The river current serious and even turbulent. We pass over Limestone Rapids with out knowing it. And thus unceremoniously pass the last of the 70 marked rapids of this trip. How varied they were and how we shall never forget many of them, while others will slip from our memories almost immediately. Limestone Rapids was not a disappointment for me. I have had my fill of rapids until the next trip. It's just as well that it consisted of only a turbulent stretch of river next to a mud bank, rather than the booming cataracts we had to carry around on the Pre-Cambrian shield. We work hard, stopping for lunch just in time for a rain shower. We again don the blue tarp hasty shelter. We start to canoe with a light rain. Tim spots a cabin and we investigate. What a place to spend a few days! It’s cold out and blowing hard. A converted, cheap trailer never looked so good. A large supper behind us, supply of firewood chopped, floor cleaned and gear put away, we are ready to relax like kings in a warm yet mosquito free environment. We are grinning at each other for our good fortune. We have probably reached the start of the complex of islands at Long Island, about 11 miles of canoeing. Camping, on a gold platter! An enjoyable warm evening, Yet, while going to sleep with the damped fire, I could not help but already miss the adventures we had just passed through, knowing it would be years if ever in my life, that these circumstances could ever be repeated. 2 August - Wednesday - A day in the cabin! Wes started the fire at 5:30 AM. He started another at 8:30 and we got up. Tim fixed a huge pancake breakfast which we ate at 11:00 AM, and continued eating until 1:30. The stove causes the pancakes to cook slowly. We spend the day in relative luxury. Wes reloads our empty 30 - 30 round, Tim fixes the Gerry stove, I write letters, and in the correspondence Journal. We wash dishes, shoot the .22, cut fire wood, it’s great! Light intermittent showers, wind from the N. We decide we will spend several days here and celebrate by writing letters and eating the food we have been hoarding. 3 August - Thursday - A beautiful day with winds from the South! Almost too good to pass up, but we are reluctant to see our trip end, and will spend time here rather than try for Churchill. Basically another relaxing day in the cabin. Tomorrow we will get up early and make a long dash to Ft Churchill if it’s at all feasible. I have taken over as cook the last 2 days. Plan on an early pancake breakfast. It will be a rough day of canoeing to make it all the way - a maximum of 31 ½ miles, it would be the most we have canoed in a day. 4 August - Friday - Up at 6:30. I start the fire in the cabin's 10 gal barrel stove and go down to the river for water. A heavy fog shrouds the forest and the wide expanse of the Churchill river. I can’t help but pause and throw the spinning lure 3 farewell shots at this beautiful point. The splashing of the lure breaking the smooth, liquid movement of the water with a resounding plop. The boys will be up soon for a challenging day of canoeing. I imagine the fog will lift, but what a navigation challenge it would be. it’s very thick. Breakfast is about ready for them, but I am reluctant to bring them crashing back to reality from their sleep. There were literally a hundred mosquitoes sharing the cabin last night. Where was our tent! The repellant saved us. 10:40 PM Ft. Churchill. This tranquil day turned out to be one of the roughest days of canoeing the entire trip. We made about 30 miles in a driving rain and strong cold wind from the NE, a quarter off the port bow. The finish was pure hell. Large rocks in the tidal flats grounded us three times, Tim jumping out to pull us off into water deeper than his waist. We approached the bleak coast road within a mile and a half, and had to carry gear and pull the canoe through the grassy swamp to a cache. We took the camera, rifle, exposed film, journals, and personal gear, then hiked to the road. Two guys picked us up, gave us a grand tour, and dropped us at the Churchill hotel. The manager gave us two rooms for the price of one (No cot available for the third guy). We spent the evening eating, two full meals apiece, plus other goodies, all without budging from the table, much to the amusement of the cooks. Friday night here is wild - pay day - drunks all over the place. We take showers and retire, for we have a busy day tomorrow; the train leaves at 5 PM and most of our gear is still stuck in the swamp. 5 August - Saturday - $5.00 truck fee and $83.00 train fare. H & B Co. cashes $30.00 check, so we are able to pay our hotel bill and buy food at a super market for the trip to The Pas. Train leaves on time at 5 PM. Man gets on several miles down the track, and proceeds to repeat the word “spastic” to himself at 1 to 5 minute intervals, all evening. Stops when he sleeps, drinks, etc, made sleep rough. 6 August - Sunday - Man awakens and continues with the "spastic", much to our amusement and irritation. We arrive at The Pas and check into the Golden arrow Motel. Eat remaining chow for supper, also spend remaining 3 dollars at A&W stand for teen burgers and milk shakes. We talk with motel owners telling of our adventure. They had been concerned about us and were about ready to contact the Mounties. 7 Aug Mon - We spend the day at The Pas washing and resting. Motel cashes $100.00 check. We can eat again! Tim carries food from the Hudson's Bay co. store, after they cash a $30 check. And as with any trip, there is the travelling home. But this drive is filled with conversations of adventures shared over the past two months, as well as the plans of the next great adventure.